This past May we purchased the Breville Smart Oven Air – it is an incredible kitchen appliance. It’s a toaster oven on steroids! Seriously this appliance bakes, broils, roasts, reheats, works as a slow cooker, toaster, has a pizza setting, is an air fryer and a dehydrator! It almost sounds too good to be true but in this case it is all true. My friend Shayda was here one weekend and we played with the Breville and she went home and bought one. Then she asked me to make a video showing how to use it and being the people pleaser that I am of course I made a video. You can purchase the Breville Smart OVEN Air at Bed Bath & Beyond – they will accept the 20% off store coupon. It’s also available at Williams Sonoma and if you open up a credit card you get a discount. It’s also on Amazon Prime with free shipping! This is an affiliate link and by using it you help support this site. I hope you enjoy the You-Tube video. I plan on making more videos in the future as I discover how to make even more delicious food in the Breville! 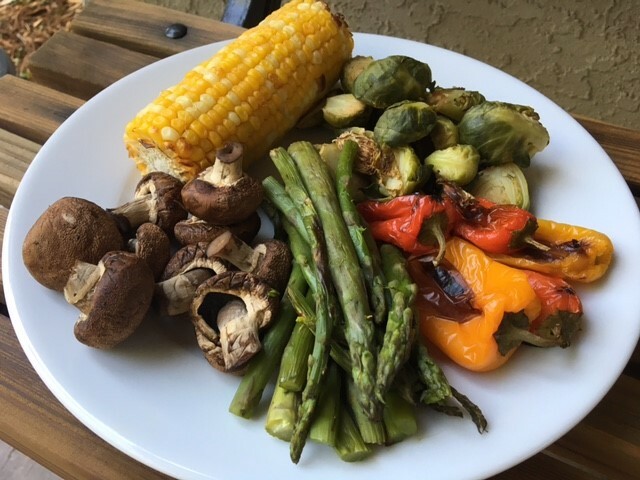 Just look at all the yummy plant foods you can make oil free in the air fryer. This cutting board fits on top of the Breville and allows you to use the extra space. The jelly roll pan fits perfectly inside for oven roasting and baking! When you use my Amazon Affiliate links for your purchases you support my work here without any extra cost to you. Thank you for your support. This dinner was made in about 25 minutes! It doesn’t need any seasoning and was all made without oil. 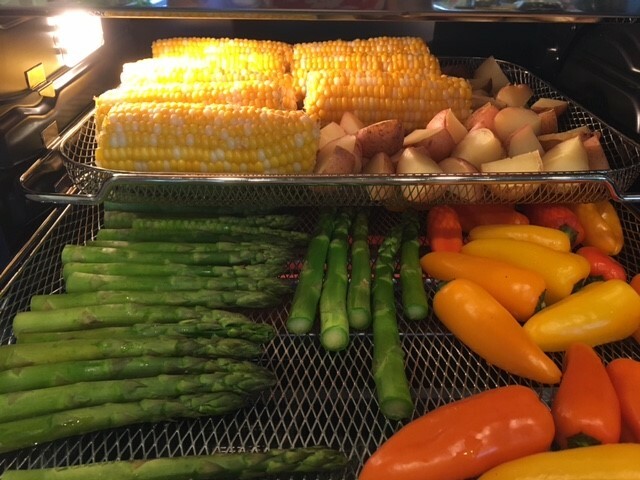 We use the mats shown below to line the air fryer trays because they make clean up so much easier! Just cut them to fit and when they get dirty wash them in warm soapy water. Easy – peasy! When you use our affiliate links you help support our work here without any additional cost to you. Thank you for your support! Be sure to check out our Amazon Affiliate Page where we share our favorite kitchen gadgets, cookbooks, hiking gear and even fun things for the grandchildren. We are a Holland Bowl Affiliate. 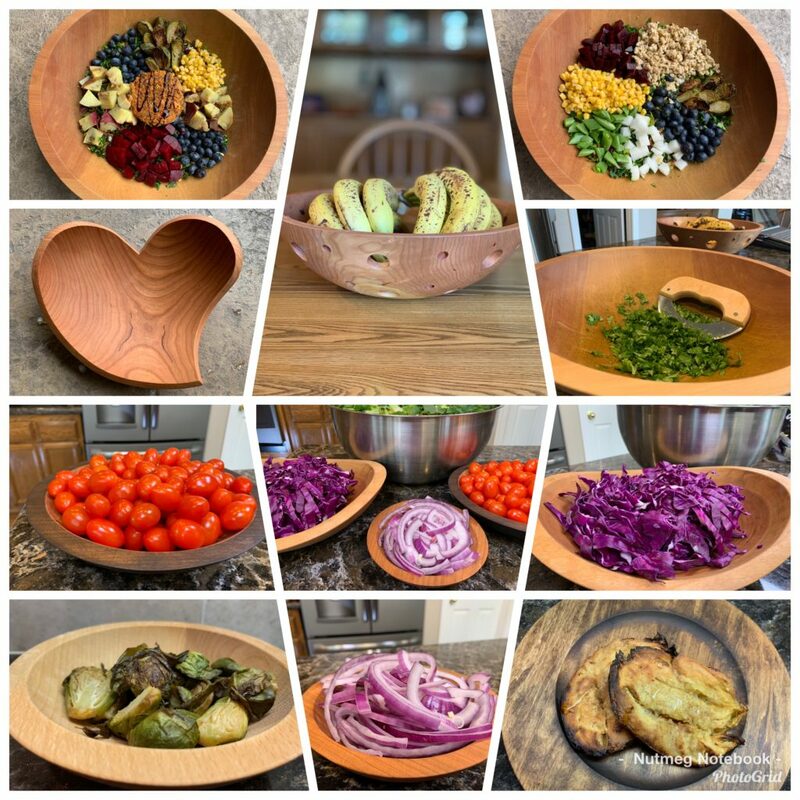 These American made bowls are heirloom quality and functional as well as beautiful. Check out the Chopped Salad Video to see how to transform a regular salad into a delicious flavorful chopped salad using a Holland Bowl. Thank you for this video as I have purchased the Breville Smart Oven and am enjoying it immensely. Can you tell me how long you air fried the brussel sprouts–seems like 40 minutes, or so? Congrats on getting the Breville! How long it takes to air fry the Brussels Sprouts depends on how big they are. Start with 20 minutes and check them – remove when they are the desired amount of brown you like.They are so good that way! You mention pre-cooking your potatoes before air frying them. How do you pre-cook them, both for white and sweet potatoes? I bake the potatoes in a preheated 400 degree oven for an hour for regular sweet potatoes and Yukon gold potatoes. Japanese Sweet Potatoes and Hannah takes take 1 hour and 20 minutes – more or less depending on the size. Then chill them in the fridge before cutting them. Works great! I try not to air fry things that are going to end up being too messy or drippy. Some people do use a tray under the air fryer basket – I would think that would disrupt the air flow but they say it still works. Things like asparagus, corn on the cob and potatoes really don’t make much mess. The tray in the bottom of the Breville slides out and cleans up pretty easy. We use the mesh liners on the trays to make clean up easier and that works well too. We have had out Breville for two years now and we love it! We use it every day – it’s one of the best additions to our kitchen ever!